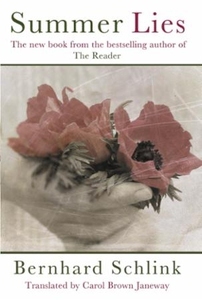 From the author of the internationally acclaimed and bestselling novel, THE READER, a mesmerising collection of stories about about love in all its guises. A conversation between strangers on a long-haul flight will change lives for ever; one night in Baden-Baden will threaten to tear a couple apart; a meeting with an ex-lover will give a divorcee a second chance; holiday lovers will struggle in the harsh reality of daily routine... As Schlink's characters navigate their lives, we discover the many faces of love: the small betrayals, hidden truths and abiding affections. In Schlink's trademark spare prose, we come face to face with the desires and jealousies that define our daily lives, with the fragility of happiness and with the abiding possibility of hope. Tender yet unsentimental, achingly personal yet utterly universal, SUMMER LIES asks what it means to love, to deceive and, ultimately, to be human.